Cacti and succulents are among the most reliable houseplants. For those new to indoor gardening, here are some reviews of houseplant books that will be very helpful. “Houseplants From A to Z” is part of Barron’s Compass Guides series. It is by Karin Greiner et al. It has over 200 lush color photos. This reader friendly book takes the mystery out of choosing houseplants. Indoor gardeners will learn how to choose plants for all sorts of locations in the home. It can also help you create effective plant displays with cacti and succulents. It has lists of suitable plants for each room or area. A whole section is devoted to choosing appropriate plants for your particular indoor conditions. Much of the book consists of the A to Z plant directory. 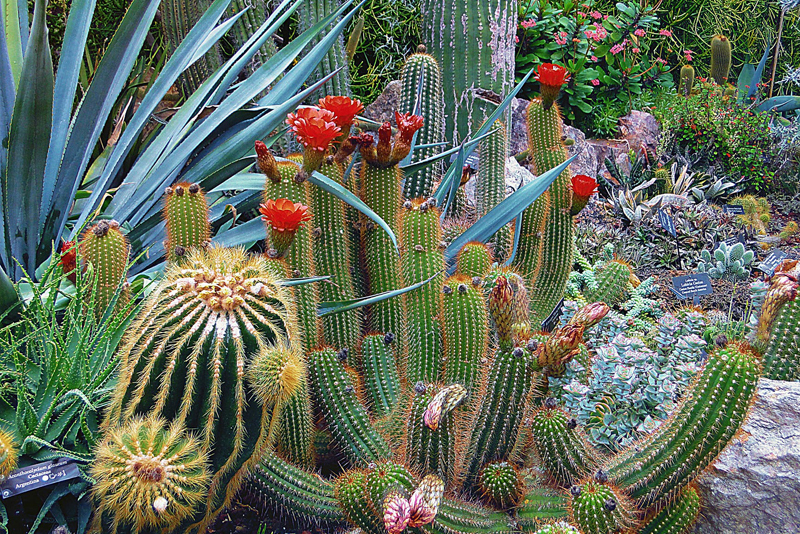 The plants are arranged into three groups with one being cacti and succulents. For each plant, the profile has an in-depth account with a photo, description, growing requirements, routine care tips, plant origins, common and Latin name. For quick reference, look for the handy symbols beside each plant name. This lets you know at a glance about the plant’s lighting needs and preferred indoor conditions. “Indoor Gardening the Organic Way” is by Julie Bawden-Davis. This was released by Taylor Trade. This groundbreaking book provides all of the basics on growing houseplants organically. It takes the guesswork out of routine plant care. It covers watering, fertilizing, grooming, and coping with pests or other problems. The author also devotes a chapter to organic potting soils, and explains how to mix your own. Beginners will also benefit from the chapters on repotting and propagation. With light being so important to most cacti and succulents, the chapter on lighting will be especially helpful. This explains how to use a light meter. Throughout the book are lists of plants for various exposures or locations. This covers all types of indoor plants, including cacti and succulents. “Miracle-Gro Complete Guide to Houseplants-Successful Techniques for Indoor Growing” was released by Meredith Books. This comprehensive guide provides details on every aspect of indoor gardening. About half of the book is devoted to the plant encyclopedia, which features over 300 kinds, many of which are cacti and succulents. For each plant, the encyclopedia has color photos, a complete description, the preferred growing conditions, routine care tips, propagation methods, and all the recommended species and varieties. The plants are arranged alphabetically by common name. In addition, this book also serves as a complete guide to indoor gardening. It explains how to choose appropriate plants and how to display them. Chapters are devoted to propagation and all aspects of plant care from repotting and choosing a potting soil to troubleshooting. This book also highlights specialty indoor gardens, including dish gardens and hanging baskets, both of which are suitable for cacti and succulents.